Uppu urundai is a healthy snack.My mom used to prepare and give it for us ,when we return from school.Since this is steamed ,it can be considered as a guilt free snack.We can have it with any chutney,but I prefer to have it simply.My mom reminded this recipe,when she came here and prepared it.This dish gave me some nostalgic memories. * Wash and soak the rice for 2 to 3 hours. * Drain the water and grind it ,like idli batter.Let the batter be bit coarse..
* Take a pan,add oil and splutter with tempering ingredients except cilantro. * Now add the grinded rice batter and mix it. * Keep the stove in medium,the batter will start getting firm as shown in the picture. * Turn off the stove,when the mixture is non sticky . * We can also check the consistancy by taking it in hand and it should be rounded into a ball. * Add cilantro and mix it. * Cool the mixture completely.After 10 mins,roll the mixture into small balls. 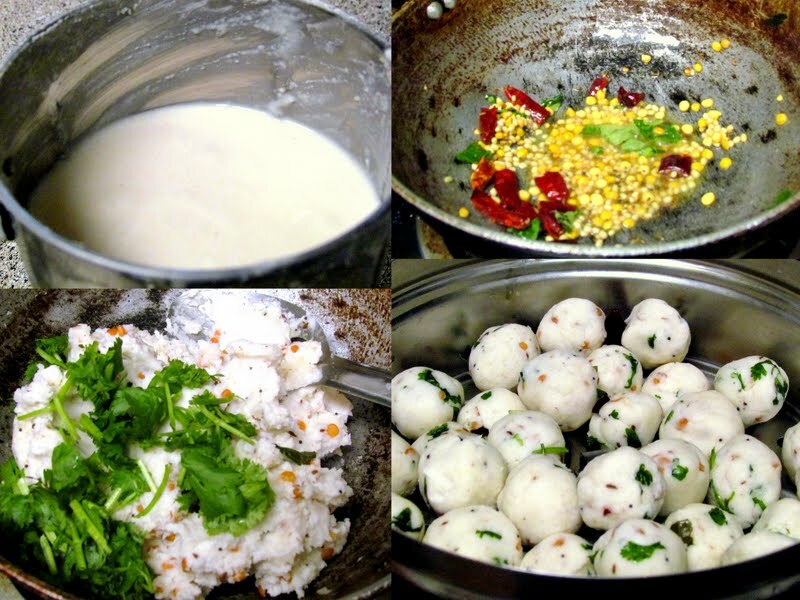 * Steam the rice dumplings in a idli cooker. * Serve with any chutney. Sending this to Heirloom recipes ,hosted by Saras's kitchen and started by Kalyani of "Sizzling tastebuds"
மறந்துபோன கிராமத்து சமையலை ஞாபகபடுத்தியமைக்கு நன்றி சவிதா!! Thanks Savitha for linking to the event and its a healthy snack hides lot of childhood memories. wow very nice...may be now i should try this! Thanks for sharing! looks healthy and delicious! love it. 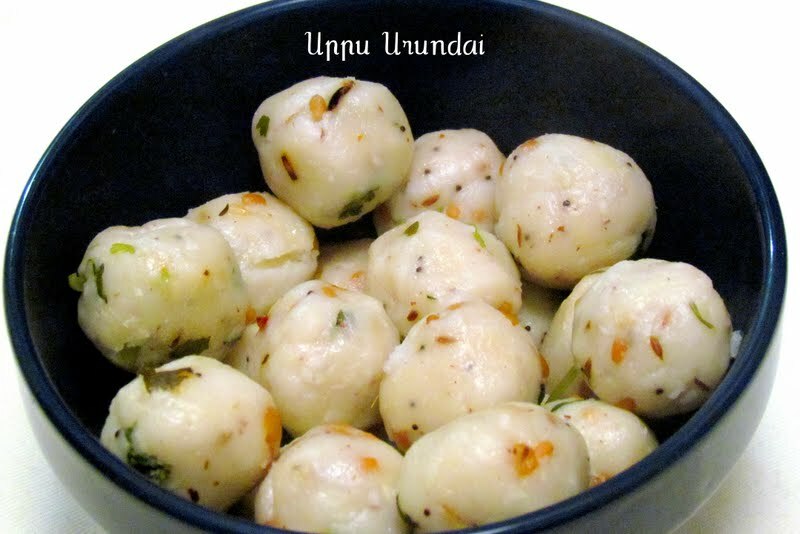 Thanks for sharing this traditional uppu urundai recipe! Uppu urundai looks delicious! A very nice photograph indeed!! Yum yum,feel like having some..romba naalachu saapitu..
அம்மா இரண்டு வாரத்திற்கு ஒரு முறையாவது இதனை செய்து கொடுத்துவிடுவாங்க...எனக்கும் இந்த உப்பு உருண்டை ரொம்பவும் பிடிக்கும்..
உப்பு உருண்டை பேரு புதுசாக இருக்கு.நல்லாயிருக்கு சவீதா. This one is one of my fav:-) My mom makes it often as tea time snack! Bookmarked! I have to make it next weekend!! authentic recipe.tried it comes out very well.added coconut pieces too..
Prathap.thank u for trying .Yes uthentic recipes will never fail.